Police vehicles blocked the left turn lane going south on Clark Street for the Cubs' home opener Monday. WRIGLEY FIELD — The Chicago Cubs are reconsidering plans to block off Clark and Addison streets during home games after some backlash from the city. Instead, the team is "working with the city for basically a different solution," said Crane Kenney, president of business operations. "There are two ways to skin the cat here," Kenney said. "The one that was recommended to us by our consultant was to close the streets, but we understand the burden that puts on the community." The Cubs discussed the change of plans Tuesday, one day after Mayor Rahm Emanuel said the streets should remain open for cars and buses. "The city's preference is probably to extend the sidewalks and increase the police presence," which was tested out on Opening Night, Kenney said. Police blocked left turns onto Addison Street for cars traveling south on Clark Street two hours before Monday's home opener. 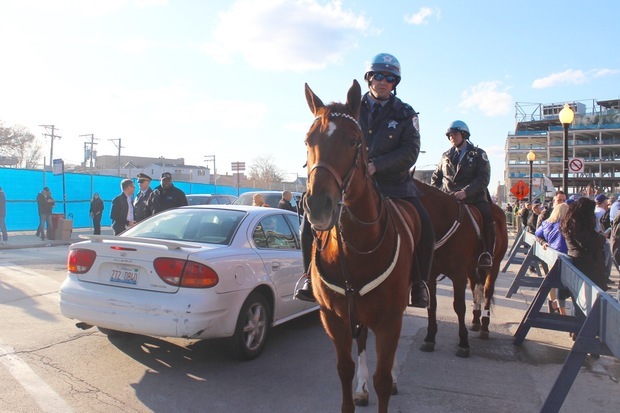 Officers on horseback, marked squad cars and unmarked police vehicles were part of the heavy police presence helping to direct traffic. The idea of shutting down streets near Wrigley Field was most recently touted by U.S. Rep. Mike Quigley (D-5th), who said the historic ballpark is a prime target for an attack in his North Side district. "I don't think they should," Emanuel said Monday. "We are working with the Cubs, with MLB" to address safety concerns. 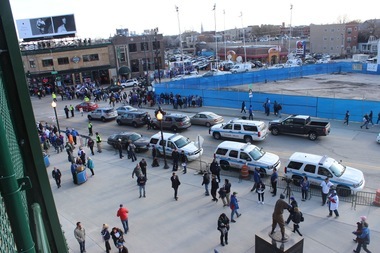 Enhanced security measures were in place for the first time at Wrigley Field for Opening Night. New metal detectors slowed entry at the gates below the historic marquee at Clark and Addison, but "by and large, it was a pretty good first experience," Kenney said. "We have to give credit to fans for hearing about the metal detectors and changing their customs to come sooner," Kenney said. "And the city presence was extremely well-done." • Why Do the Cubs Want to Block Off Clark and Addison During Games?